UT is Ready for the World | Where in the World is Smokey? Several UT Knoxville researchers were in Beijing Oct. 15-18, 2008, to take part in the second annual China-US Workshop on Bioenergy Consequences for Global Environmental Change at the Chinese Academy of Sciences. UT hosted the 2007 workshop. 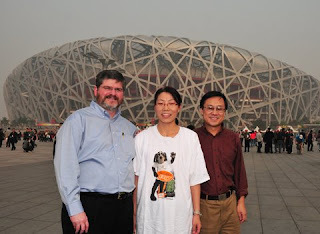 In the first photo, (left to right) Randall Gentry, director of UT’s Institute for a Secure and Sustainable Environment (ISSE); Yuling Fu, research assistant for the Chinese Academy of Sciences; and ISSE Research Director Jie (Joe) Zhuang pose in front of the Beijing National Stadium, the Bird’s Nest, which served as the centerpiece of the 2008 Olympic Games. 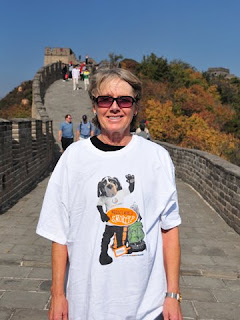 In the second photo, ISSE Research Leader Mary English on China’s Great Wall. 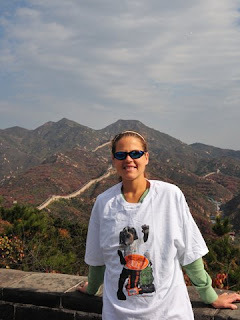 And, in the third photo, Kathleen Daumer Cusick, a doctoral student in UT’s Center for Environmental Biotechnology, poses on China’s Great Wall.